But Inside Out is in the top rank of Pixar productions with its combination of audacity, intelligence, wit and emotional reward. Directed and co-written by Pete Docter (Monsters, Inc and Up) and co-directed by Ronnie del Carmen, Inside Outstarts from a boldly abstract premise: the narrative plays out within the psyche of a girl named Riley and the film’s characters are her feelings. At the start, one of those feelings, Joy, asks: “Do you ever look at someone and wonder what is going on inside their head?” The next questions that arise are: what might such psychic events actually look like? And how might they generate a story that can be sustained for 102 minutes? Inside Out meets these challenges with an inventiveness that’s appropriately mind-boggling. “Inside Out” is new in theaters this weekend, and it’s a glorious return to classic form for Pixar. After cranking out numerous original hits, they’ve relied on a few sequels that haven’t been quite up to par…but here they show that they’ve still got their fastball. Young Riley and her family are moving, and inside her head the real movements are taking place. The five primary emotions of Joy, Sadness, Fear, Disgust and Anger run the show, and it’s a hilarious and creative take on the human being thought process. Joy and Sadness must go on an adventure deep inside the mind; but we get a nice sampling of all five throughout the story. Amy Poehler and Lewis Black stand out as Joy and Anger respectively; but the crew working together really make the story tick. Kids can learn how to balance their emotions while being entertained, and adults will find plenty of humor geared towards them as well. It’s more than just a return to form for Pixar; “Inside Out” might be one the best films they’ve ever made. Tinker Bell is a feisty fairy and major character in Disney's 1953 film, Peter Pan, the 2002 sequel, Return to Never Land, and the main character in a popular series of made-for-DVD movies in the saga. In the many years since her inception, Tinker Bell has become one of the main spokes-characters forThe Walt Disney Company and one of its most popular and iconic characters. Since the release of the original Peter Pan in 1953, Tinker Bell has been known for being a silent character up until the release of her very own 3D computer-animated film Tinker Bell and all of its ever-expanding sequels. Since then, the character has been voiced by Mae Whitman. The fairy tale gets a Technicolor treatment in Disney first animated feature. Jealous of Snow White's beauty, the wicked queen orders the murder of her innocent stepdaughter, but later discovers that Snow White is still alive and hiding in a cottage with seven friendly little miners. Disguising herself as a hag, the queen brings a poisoned apple to Snow White, who falls into a death-like sleep that can be broken only by a kiss from the prince. Once upon a time, a prince named Adam is cursed by an enchantress disguised as an old woman to become what he is on the inside: a hideous beast. The only way to break the curse is to find someone to love and love him in return before the last petal falls from an enchanted rose. Belle is a beautiful young woman who loves reading and dreams of "something more than this provincial life". She's especially sick of fighting off her boorish, egotistical suitor Gaston. Her father, Maurice, is an inventor who gets lost on his way to a fair and comes upon the Beast's hidden castle. He is taken prisoner there and Belle gives up her freedom to take his place there forever. The Beast's servants, who were changed into enchanted objects which fit their personality, hope that this is the girl they've been waiting for. Full of comedy, romance, and beautiful animation, this is the only animated feature to be nominated for the Best Picture Oscar. It also has six songs and a wonderful score written by the award-winning duo Alan Menken and Howard Ashman (who died of AIDS before the film was completed). In 1994, it was made into a beautiful Broadway musical. In 2001, the movie was re-released into special theaters with an originally song "Human Again". The directors weren't sure how to make it work in the film, but after seeing how it was done in the play, they decided to animate it and integrated it seamlessly into the film. Check out the most popular barbie Facebook Covers. We offer the largest selection of barbie FB Covers on the web. The best barbie Facebook Covers on the web Get barbie covers for your Facebook profile from this website. We have thousands of information about barbie..
Rapunzel is a German fairy tale in the collection. "Rapunzel, Rapunzel, let down your hair, so that I may climb the golden stair". One day, a prince rides through the forest and hears Rapunzel singing from the tower. Entranced by her ethereal voice, he searches for her and discovers the tower, but is naturally unable to enter. He returns often, listening to her beautiful singing, and one day sees Dame Gothel visit, and thus learns how to gain access to Rapunzel. When Dame Gothel has gone, he bids Rapunzel let her hair down. When she does so, he climbs up, makes her acquaintance, and eventually asks her to marry him. She agrees. Together they plan a means of escape, wherein he will come each night (thus avoiding the Dame Gothel who visits her by day), and bring Rapunzel a piece of silk, which she will gradually weave into a ladder. Before the plan can come to fruition, however, she foolishly gives the prince away. In the first edition of Grimm's Fairy Tales, she innocently says that her dress is getting tight around her waist ; in the second edition, she asks Dame Gothel (in a moment of forgetfulness) why it is easier for her to draw up the prince than her. In anger, she cuts off Rapunzel's hair and casts her out into the wilderness to fend for herself. When the prince calls that night, Dame Gothel lets the severed hair down to haul him up. To his horror, he finds himself staring at her instead of Rapunzel, who is nowhere to be found. When she tells him in anger that he will never see Rapunzel again, he leaps from the tower in despair and is blinded by the thorns below. In another version, she pushes him and he falls on the thorns, thus becoming blind. For months, he wanders through the wastelands of the country and eventually comes to the wilderness where Rapunzel now lives with the twins she has given birth to, a boy and a girl. One day, as she sings while fetching water, he hears her voice again, and they are reunited. When they fall into each other's arms, her tears immediately restore his sight. He leads her and their children to his kingdom, where they live happily ever after. 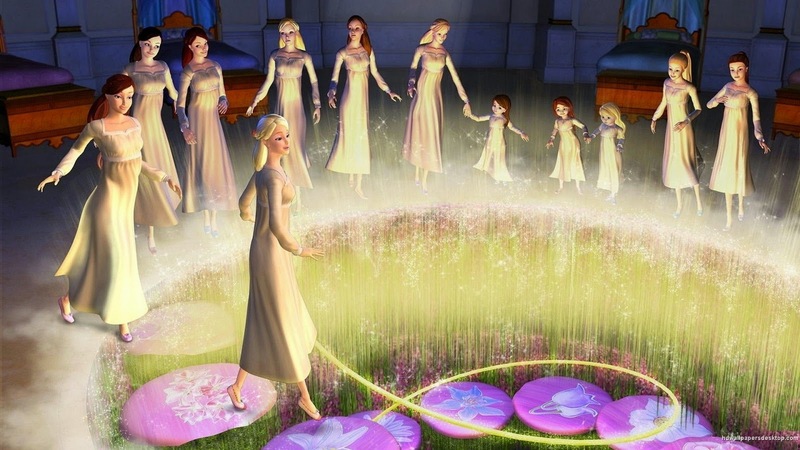 In some versions of the story, Rapunzel's hair magically grows back after the prince touched it. 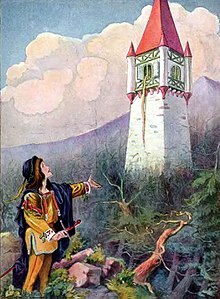 In another version of the story, it ends with the revelation that the enchantress had untied Rapunzel's braid after the prince leapt from the tower, and it slipped from her hands and landed far below, leaving her trapped in the tower. 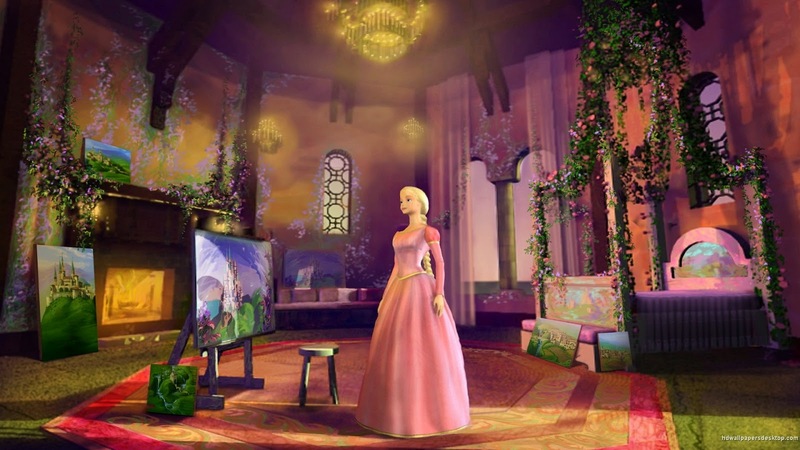 Barbie stars as Genevieve, one of twelve princesses who live in a castle with their widowed father, King Randolph. The princesses have adventurous and free-spirited natures that are viewed as "unladylike" and "non-proper" by other members of the royal society. This leads King Randolph to summon his cousin, Duchess Rowena, to the castle to help raise the princesses. Unbeknownst to King Randolph, Rowena plans to poison him and get rid of his daughters so that she can become queen. Attempting to break the princesses' spirits, Rowena makes their lives miserable by stripping the castle of everything they love, banishing singing and dancing. The princesses find comfort in their late mother's favorite story, which tells of a magical kingdom where golden flowers grant wishes and princesses can dance at an enchanted pavilion for three nights. The princesses realize that the story contains clues on how to enter the magical kingdom from their own bedroom, by dancing on specific stones on the floor. Now inside the magical kingdom, the princesses discover that the water there possesses healing properties. The next day, the princesses appear tired and the duchess finds their new dancing shoes worn through, arousing her suspicion. The royal cobbler and Genevieve's love interest, Derek, comes to fix their shoes and sees that they are covered in gold dust. When King Randolph mysteriously falls ill, Genevieve is prompted to ask Derek to investigate Rowena's true intentions. That night, the princesses return to the magical kingdom to dance. During this time, Derek discovers that Rowena is stealing heirlooms from the castle and dealing with an apothecary, and he rushes back to the castle. The next morning, the sisters are again exhausted. Rowena interrogates and threatens them, but when they tell her the truth she refuses to believe them, forcing the princesses into servitude. Heartbroken, they return to the magical kingdom, and Rowena finds the princesses gone the next morning. That evening, Derek makes it back to the castle but discovers that the princesses are missing. He sneaks into their bedroom and, remembering the dance Genevieve had shown him earlier, enters the magical kingdom to report his findings to the princesses. Rowena's monkey minion, Brutus, watches as Derek enters the magical kingdom and reports what he has seen back to Rowena. Rowena uses this knowledge to enter the magical kingdom, where she steals some of the gold flowers that grant wishes. Rowena then returns to the castle and destroys the gateway to the magical kingdom. The princesses and Derek are trapped in the magical kingdom. However, they eventually discover that, when Genevieve and Derek dance together, everyone floats up into the sky and they are able to return home through a different gateway that leads to their mother's dance pavilion. Upon returning, they learn that Rowena has taken over as queen. The princesses break into the castle to confront her. After a struggle, Rowena uses the gold flowers to wish that Genevieve dance forever. When the flower dust comes towards Genevieve, she uses her fan to blow the dust back towards Rowena, who begins to dance. When Rowena's footman tries to help her, he is pulled into the dance, too, and the two villains dance their way out of the castle. Lacey then uses some water brought back from the magical kingdom to heal their dying father. When he heals, King Randolph explains that Rowena had been poisoning him and apologizes to his daughters for not believing them. With the conflict resolved, Genevieve and Derek celebrate their wedding. whom do you think as the best? Rosella is a 16 year old girl who can talk to animals! She's adventurous, kind and brave. When Prince Antonio invites Rosella to visit his kingdom her animals friends come, too! Queen Marissa of Paladia is a character in Barbie as The Island Princess. She is the monarch ruling over the kingdom of Paladia, and she is voiced by Kate Fisher.